As Republican President-elect Donald Trump prepares to take office armed with plans for major tax cuts, infrastructure construction and a major military buildup, a new report by the Government Accountability Office warns that the government must come to grips with a looming fiscal crisis that is driving the national debt towards a record $20 trillion. The new report issued Tuesday acknowledges that the incoming administration faces serious economic, national security and social challenges that will necessitate new spending. “Federal spending continues to outpace revenue – by $587 billion in 2016 – and absent policy changes, the structural gap between revenues and spending puts the federal government on an unsustainable long-term fiscal path,” the GAO stated. The report, a consolidation of federal financial studies and audits, argues that the surge in deficit spending last year should be a wake-up call for government leaders and policy makers. 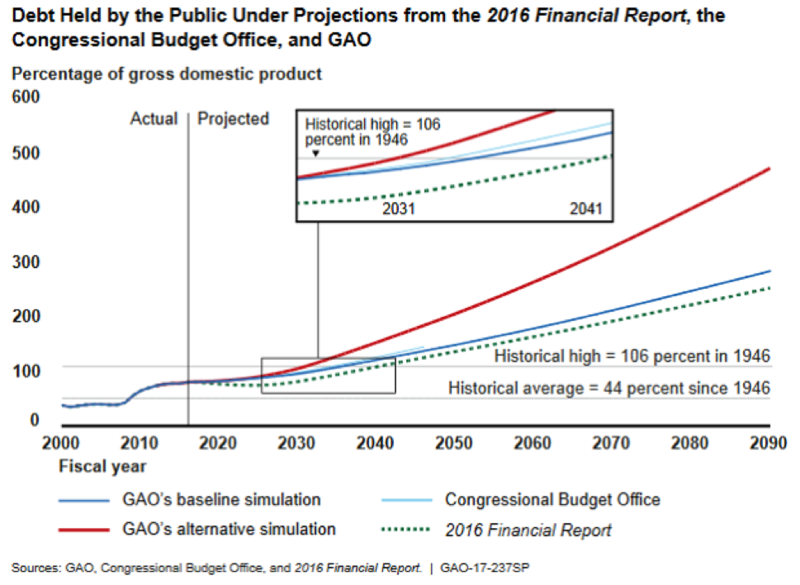 Last August, the non-partisan Congressional Budget Office reported that the fiscal 2016 budget deficit would increase in relation to gross domestic product for the first time since 2009 and would continue to rise for the coming decade. With government spending outpacing revenues throughout the year, the fiscal 2016 deficit totaled nearly $587 billion, or about $148 billion more than the previous year’s shortfall. Without major changes in policy, such as Congress approving higher taxes or reforms to Social Security, Medicare and other major entitlements, the deficit is projected to grow considerably in the coming decade as a share of the overall economy. Publicly held debt rose as a share of the overall economy from 74 percent at the end of fiscal 2015 to 77 percent at the end of fiscal 2016, compared to an average of 44 percent of gross domestic product over the past 70 years. The U.S. gross national debt -- the sum total of all borrowing and internal governmental obligations -- currently stands at $19.96 trillion and is on track to breach $20 trillion in the coming month. “The longer action is delayed, the greater and more drastic the changes will have to be,” the GAO said in its report, echoing previous warnings from GAO, CBO and other government spending auditors. Absent a significant change in course, the debt-to-GDP ratio will surpass its historic high of 106 percent within 15 to 25 years. The GAO report indicates that long-term shortfalls in the Medicare Hospital Insurance and Social Security trust funds “add to the importance of beginning action.” Medicare and Social Security will begin to spend more than they take in by the end of the decade, according to the most recent report of the trustees. Long-term insolvency of these and other entitlement programs are problems that Congress and the incoming Trump administration will have to address. A showdown over entitlement reform could come sooner than later as Trump and congressional Republican leaders have begun pressing to repeal and replace the Affordable Care Act. What’s more, the report said, executive actions alone cannot put the U.S. government on a sustainable fiscal path, and that it is important that departments and agencies “act as stewards of federal resources. Reduce improper payments. The government for decades has struggled to reduce overpayments in Medicare, Medicaid and other entitlement programs as well as in major contracting. Since fiscal 2003, cumulative estimates of overpayments have totaled over $1.2 trillion. Address the persistent tax gap. The report notes that beyond the problem of the structural mismatch between spending and tax revenues, with more money going out than coming in, the IRS and other agencies could do a much better job of collecting what is owed the government. The annual gross tax gap is estimated to be $458 billion. Continue to combat duplication, overlap and fragmentation. The government watchdog agency has highlighted many areas where better management or consolidation of activities could result in big savings. Steps taken so far by Congress and the executive branch have resulted in about $56 billion in financial benefits between 2010 and 2015, with at least an additional $69 billion of estimated benefits projected through 2025.